I am always looking for new recipes that I can easily put together for a dinner party or event. This summer I am determined to not only fill up my recipe box but also whip up some fun, trendy summer dishes... Starting with pineapples! Bon appetit! 1. Mix cream cheese and crushed pineapple together. 2. With buttered hands, roll the spread into a ball. that the ball is completely covered in pecans. 4. Refrigerate. Serve with crackers and enjoy! 1. 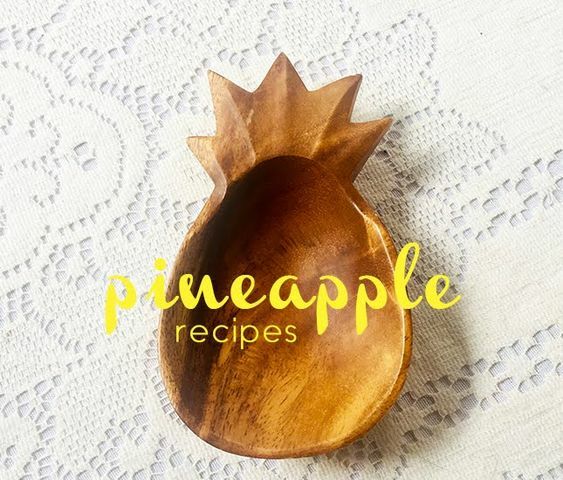 Cut the pineapple into chunks and puree in a blender with granulated sugar and water. 2. Chill the pineapple mixture in the refrigerator for at least one hour. 3. Grab fun bowls and spoons to serve. Enjoy! Lately, it seems that fruit is the newest fashion statement. Pineapple towels, lemon dresses, watermelon hats, you name it! So, if you are like me and want to prep your wardrobe with on-trend pieces, check out the Monogrammed Pineapple Key Chain sale over at Marleylilly.com. Trust me, you won't want to miss out on this cute summer accessory! What are your favorite summer recipes? Comment yours below!